The developer configures the OptAB application via special forms within the application itself, accessible from the same main menu. He is therefore immediately able to see the effects of his changes as they will be seen by the user. Once development is complete, the configuration options will be hidden. 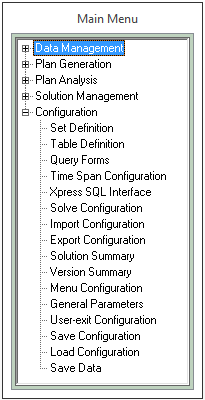 A selection of the configuration forms is presented here. 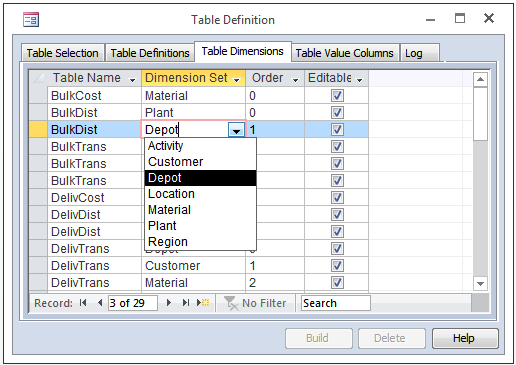 Data sets and tables are defined by entering data into the data structure configuration forms, supported by drop-down lists of options wherever possible. 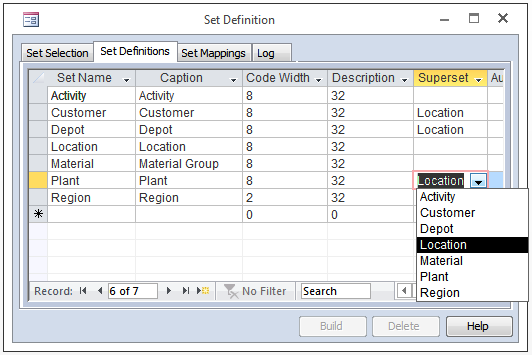 In addition to the standard code and description fields, relationships with other sets may be defined, for example subset/ superset, and mappings from members of one set to members of another. Sets are built by clicking on the Build button. The developer may also select to build view/edit forms, database relationships and Visual Basic modules to make each set accessible via a custom class. Tables structures are defined by a series of dimension sets (selected from the list of defined sets), and a collection of value fields which may be numeric with various levels of precision, date and time, text, selections from an option list, members of a set or RGB colour values (for use with graphics). Table build offers a similar set of options to set build. 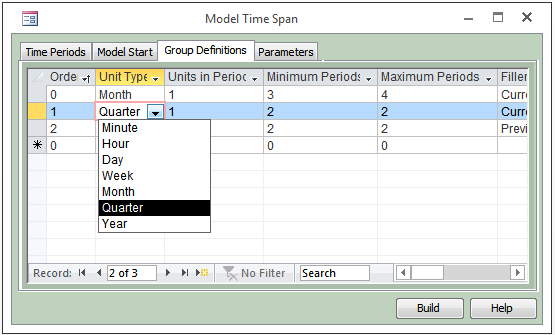 A complex time period structure may be developed by building up a series of groups, each group defined by a given time unit (for example day or week), or fixed multiple of a time unit. The number of time periods in each group is then either fixed or may vary according to the occurrence of the first entry in the next group. 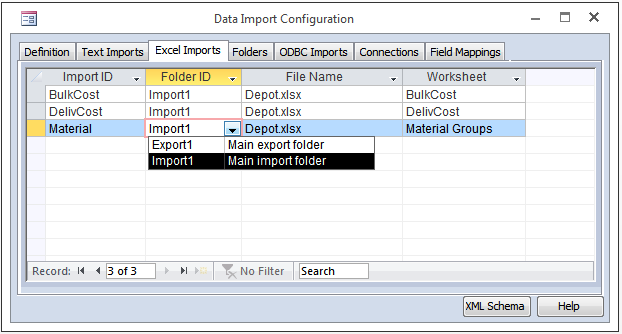 Imports are simply configured by associating an import ID with a database set or table, then providing appropriate information for the import source type – a filename and worksheet for a spreadsheet, or an ODBC connection string and table name for a database connection, for example. 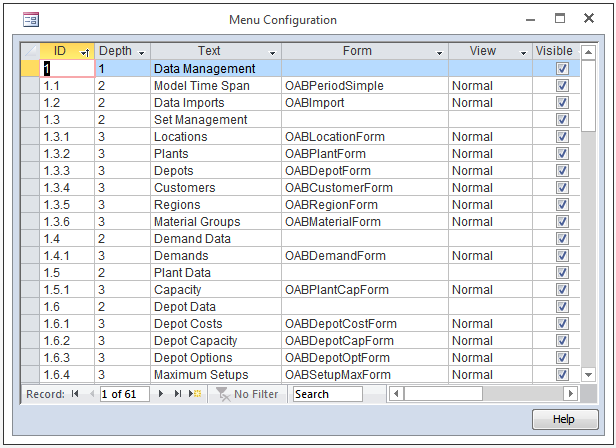 Field mappings allow field names in the data source to be mapped onto names in OptAB, where they are different. Menu configuration is simple and intuitive. Changes are displayed by reopening the menu form. 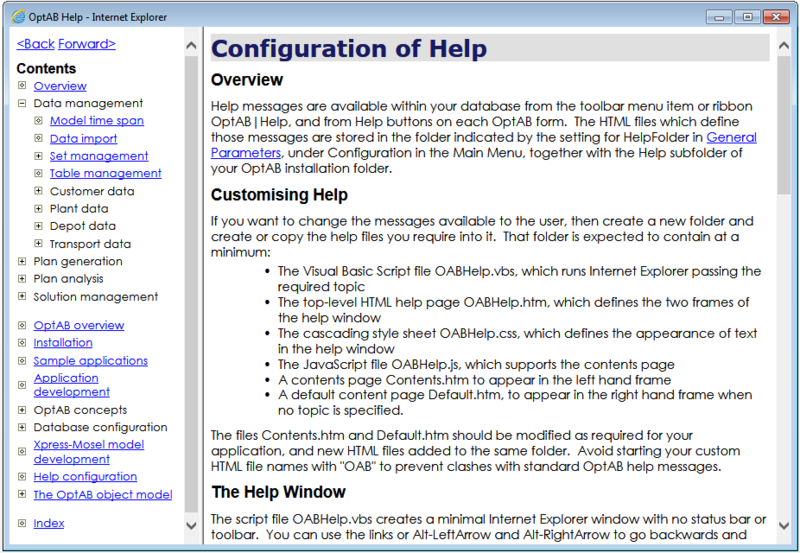 Help is configured by editing HTML files – and as ever detailed help is provided. You are free to develop new forms and Visual Basic code to support them. In the custom Gantt chart below, the user can select scheduled activities and drag them to a new time or onto a new facility. His interactive changes are stored into a database table. The form was developed using the OptAB data objects model and graphical objects model. 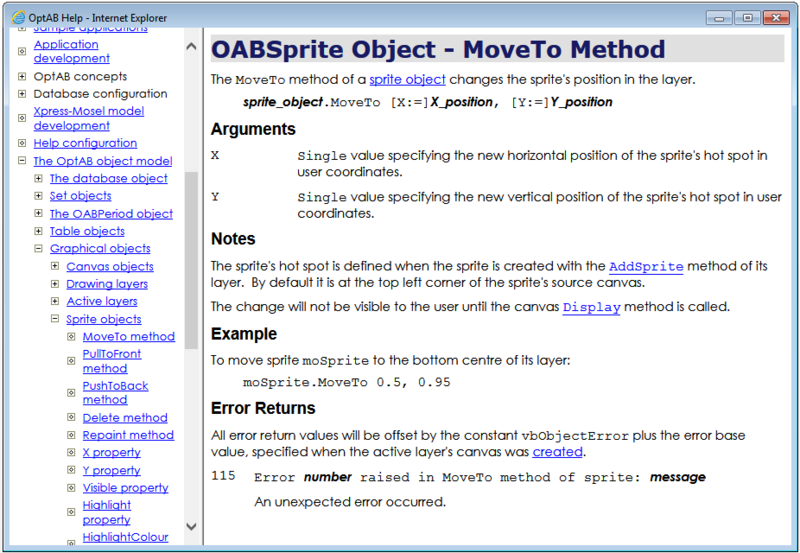 Detailed help is also provided for the OptAB object model.